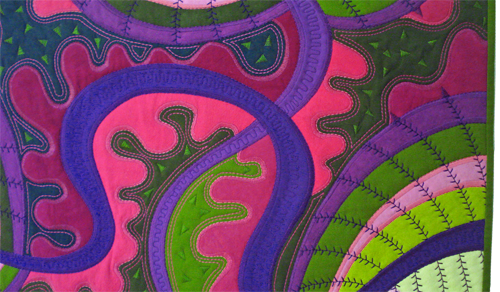 Tips on using decorative sewing machines stitches from quilt artist and fabric designer Jane Sassaman. Many people are afraid of using the decorative stitches on their sewing machines. I suspect they are afraid the stitches may look too mechanical or that they won’t be able to control them. But if the stitch is thoughtfully applied and adjusted according to its use, machine embroidery stitches can look very organic. And if you take it slow and easy as you guide the fabric the machine will take care of the rest. Even the satin stitch, which is the most mundane and mechanical stitch on the planet, can become lyrical by simply adjusting the stitch width as you sew. I usually give myself a formula to follow. When I sew around a wavy edge, for example… every time it wiggles “out” I make the stitch narrower and every time it wiggles “in” I make it wider. 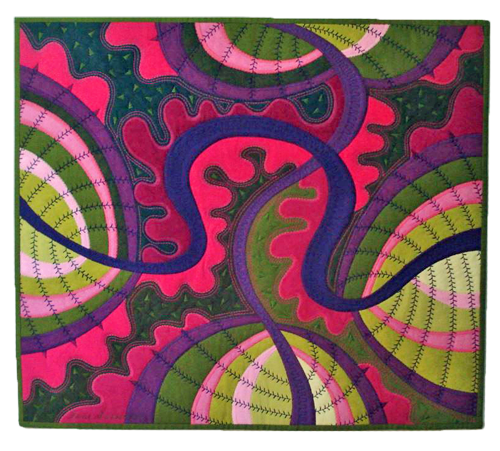 On another quilt it formula may be different, but whatever the formula is, it needs to be consistent throughout the piece. 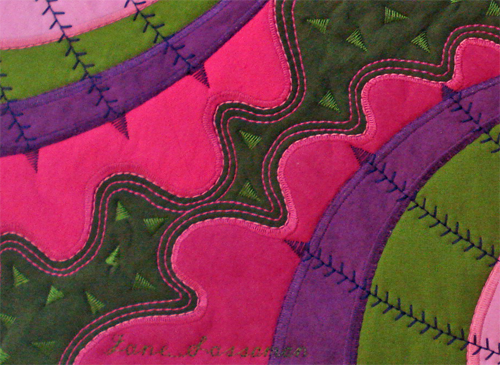 I also like to create different textures for quilting, like the floating triangles. 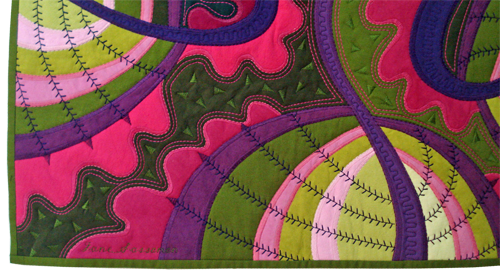 These spaced triangles are used to “tack” the layers together and make a very different effect than a quilting “line”. I adjust the length and wide according to the space that needs filling and set the machine to stitch just a single unit. I love this feature, as the machine stops stitching automatically when each shape is completed.